The Greek troglo- also means, "one who creeps into holes" and "a hole formed by gnawing". 1. A genus of small passerine (perching) birds: Members of the wren family of birds are called Nannus troglodytes because they often live in holes. 2. Etymology: the genus name (Greek troglodytai, from trogle, "a hole" (properly "a hole formed by gnawing" and dyein, "to enter") refers to the tendency of these wrens to enter small crevices and similar areas as they look for food. A cave fish: The species of Troglichthys rose live in underground chambers and are recognizable by their distinctive pinkish color. The Troglichthys rose, like other fish in grottos, has a row of pressure sensors along each side of its body which enables it to detect other animals several yards away. 1. An organism found only in caves or subterranean passages: Jack, the scientific spelunker (cave explorer), was studying the plant troglobiont which was found in the deep recesses of the cave. 2. An animal living entirely in the dark parts of caves: Many troglobionts have adapted to life in caverns and no longer have functional eyes; in other words, they are blind. Descriptive of fauna (animals) and flora (plants) which live in tunnels on a permanent basis: The troglobiotic species of creatures sense their surroundings primarily by touch, often using smell to track down food; for example, cave crickets detect food by using their antennae, while spiders use their feet. In subterranean streams and pools, troglobiotic fish and salamanders sense vibrations in the water. A creature which lives entirely in the dark parts of underground enclosuress: Troglobites are cave-dwelling creatures that navigate without eyes, go for weeks or months without food, and are believed to be able to exist for more than a hundred years. Here is some additional information about troglobites. 1. A reference to any creature having a cave-dwelling mode of life: Some species of bats are more troglobitic than others in terms of establishing a life cycle in caverns. 2. Descriptive of an animal living entirely in the dark parts of underground dwellings: Most troglobitic creatures have become specifically adapted for life in total darkness and over time they have evolved to develop improved senses of smell, taste, and vibration detection, while losing anatomical features that are unnecessary without light; such as, eyes and pigmentation. To live in subterranean chambers or passages: Pre-historic humans often troglocoled in underground spaces or cavernous areas. A tendency of organisms to live in subterranean coves or tunnels even on a temporary basis: Large brown bears have some troglocolid characteristics in that they hibernate in caves during the winter. A reference to living entities that exist in underground passages or hollows: All troglncoline communities that survive in deep caves depend on replenishment from the outside world, whether through underground streams, or food brought in by other animals. Many troglocoline species include certain species of fish, crayfish, and flatworms; however, most of them have a ghost-like pallor or unnatural paleness on their outer surfaces and cannot see and some don't even have any eyes. The troglocoline animals are born, reproduce, and die without ever leaving their caves; unless they are accidentally carried out. Characteristic of certain life forms that tend to live in dark caverns: The paintings on some ancient cave walls depicted troglocolous forms of humans who apparently lived in the underground chambers many centuries ago. 1. 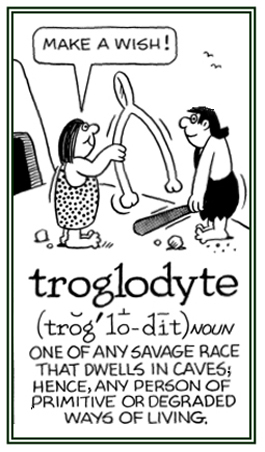 A prehistoric cave dweller or a primitive race of people who lived in caves, dens, or holes: Figuratively, a troglodyte is someone who lives in degradation or has a brutal and uncivilized nature. 2. A person living in seclusion or someone who is considered to be reclusive, reactionary, and out of date: Usually a troglodyte is someone who is unacquainted with what is going on in the rest of the world. Some computer programmers are thought of as being troglodytes because they work alone with their machines and have little contact with other people. 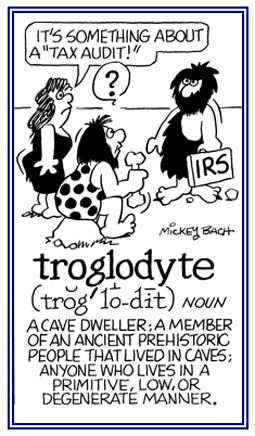 The term troglodyte doesn't necessarily apply just to prehistoric cave dwellers. 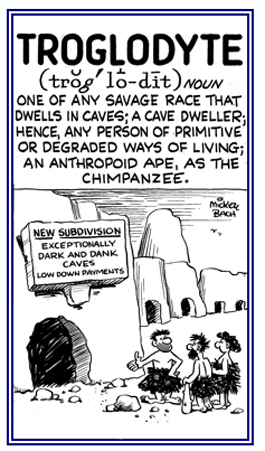 It also describes someone who lives in a dingy domicile or people who are so socially inept or culturally deprived that they seem to have just emerged from a subterranean cavity into the "blinding light of civilization" or those whose thinking or behavior is considered to be uncivilized and backward. 3. Creatures that live underground: Moles, worms, ants, etc. are considered to be troglodytes because they exist in the terra firma or soil. 4. Etymology: from Greek trogle, "hole" + dyein, "get into". © ALL rights are reserved. 1. House wren or common American wren that nests around houses: The Troglodytes aedon is a term that includes a group of small active brown birds of the northern hemisphere which have short upright tails, feed on insects, and often go into small crevices and similar areas where they look for food. 1. A reference to a person who is a caveman, or anyone who dwells in such a place: There once were tribes of Indians in North America who lived in troglodytic shelters in cliffs. 2. A descriptive term for anyone who lives in seclusion or solitude (alone): When he was existing alone, Simon had a very troglodytic lifestyle in that he was avoiding contact with anyone else. Of or pertaining to a cavern-dweller, a hermit, or certain kinds of avians: Wrens are troglodytical birds that usually build their nests in holes. All troglodytical hermits who live in underground dens are considered to be primitive in character, coarse, brutal, or degraded in the way they look, live, or behave. The scientific family name of a group of birds; such as, wrens, thrushes, and mockingbirds, which share specific characteristics regarding numbers of toes, perching habits, etc. : Sometimes regarded as a subfamily of Timaliidae, called Troglodytidae, and so named because of a reference to the tendency of wrens to enter small crevices and similar areas as they look for food. Related "cave, cavern" word sources: cav-, cavern; speleo-; spelunc-, spelunk-; stalac-, stalag-.